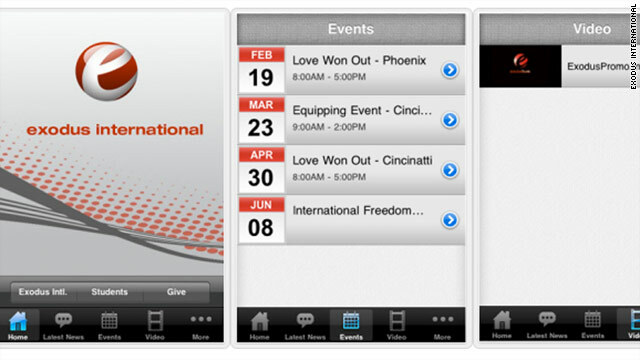 The app is like a portable version of Exodus International's website. (Mashable) -- More than 150,000 people have signed an online petition calling for Apple to remove an app from the iTunes store that was created by a Christian organization they say is anti-gay. Exodus International, which according to its website has ministries that "provide support for individuals who want to recover from homosexuality," released the app on February 15. The app had a 4+ approval rating from the Apple app store, and the organization is quick to point out that this rating is reserved for those apps that "contain no objectionable material." Gay rights activists obviously disagree. "No objectionable content? We beg to differ," reads the Change.org petition that was started by non-profit LBGT advocacy organization Truth Wins Out. "Exodus' message is hateful and bigoted. They claim to offer 'freedom from homosexuality through the power of Jesus Christ' and use scare tactics, misinformation, stereotypes and distortions of LGBT life to recruit clients." The app is like a portable version of Exodus International's website. It has a calendar of events, news, links to Exodus's social media sites and videos. Those items, like corresponding features of its website, reflect its belief that someone can be counseled away from homosexuality. In a blog post, the organization writes that it intends to broaden its reach with the app. Despite the petition calling for the app's removal, which suggests Exodus International is dangerously broadening its reach toward youth, and a storm of negative complaints posted on the app's download page, Apple has not taken the Exodus International App [iTunes link] down. Apple responded differently to a similar situation last year. According to Pink News, the company shut down an anti-gay app created by a Christian group after a mere 7,000 people signed a change.org petition calling for its removal. At the time, Apple said in a statement that they had removed the app because it violated its developer guidelines by "being offensive to large groups of people."